We regularly come across scenarios where there appears to be a conflict between the requirements of one regulation or requirement and another. Requirement B1, Means of warning and escape of the Building Regulations requires means of escape windows in the upper storey of a house to be positioned in such a way that people can readily climb out of them in the event of a fire. This requirement can create problems when trying to design a layout that involves placing a room in the centre of the house with a window overlooking a side boundary. Whilst the Building Regulations require the escape window to be positioned with the opening no higher than 1100mm above the floor level, the planners will want to protect the privacy of the neighbouring property and they do this by controlling the type of glass or the position of the window. If the proposed window would look out over a boundary to an adjacent property the planners are likely to ask for the window to be either non opening and obscured, or positioned at a height of more than 1700mm above the floor. A non opening window with obscured glass in a bedroom is likely to be claustrophobic, would not comply with B1 or indeed F1 Ventilation, whereas a window placed at 1700mm above the floor would also not comply with the requirements for means of escape. Even though B1 is concerned with saving people’s lives in the case of the fire it will not trump the planning requirements for protecting the privacy of neighbours. If your design relies on this solution it is time to come up with another design. In Victorian or Georgian properties sash windows are often positioned with the cills a short distance above the upper floor level. Heights of 450 to 600mm for the height of the window above the floor level are not uncommon. The design of any extension to these properties is likely to work well when the position and shape of windows in the extended or altered part has some relation to the existing windows, indeed the planners may actually insist on it. Here the conflicting requirements stem from requirement K2 Protection from Falling of the Building Regulations which aims to protect people from falling out of an open window that is less than 800mm above floor level. A solution to keep both the planning office and building inspector happy is to incorporate a fixed guard on the inner face of the window at a height of 800mm. Another conflict which clients often complain about appears to be between L1B Conservation of fuel and Power in Existing Dwellings and F1 Means of Ventilation. At first glance the need to have trickle vents to all rooms and mechanical extract fans in kitchens, bathrooms and WCs, or an alternatively system of permanent vents in the ceilings linked to a passive stack system appears contrary to the requirements of high levels of insulation and draught proofing as required to conserve energy and reduce CO2 emissions. But a greater understanding of the problems associated with condensation in buildings with highly insulated envelopes explains the reasons why the ventilation is so essential. Requirement B1 can also require dramatic changes to the escape route when a two storey house is converted to a three storey building with a loft conversion. These requirements include the need to create a protected stairway from the new 2nd floor which would necessitate the existing doors in the house from bedrooms, living rooms and the kitchen that access the hallway and staircase being replaced with shiny new fire doors. Proposing this change on a listed building is likely to rub the Conservation Officer up the wrong way. A full understanding of all regulatory requirements at an early stage of the design by a professional designer such as Space and Style Home Design can prevent the design running into unforeseen problems further down the line. On a recent visit to Germany I was reminded of the stark differences between the German housing system and our own. In the UK people are encouraged to get on to the property ladder as soon as possible, with the age of first time buyers being seen as a crucial part of the economy with statistics regularly reported on in the media. Once on that ladder, people and families move up through the ladder to increase the size of their home in line with their growth in income all at the expense of ever larger mortgages. New housing is dominated by large house builders who generally build the same few house types the length and breadth of the country, adding a token different cladding or tile here or there to appease the local planners. Houses are sold by number of bedrooms not size and as discussed earlier and are nearly always undersized. But despite Government intentions to increase opportunities for self builders, plots are rare to come by, expensive to buy and difficult to get planning permission on, so the dream for the majority of Brits wanting to build their own home remains as a dream. Due to a number of factors the age of first time buyers in Germany is typically much older than in the UK, but Germans do not buy into a property ladder, they buy a house to be the all time family home. So how refreshing it was to visit a show village for new houses in northern Germany. The Musterhauspark or model home park in Bad Fallingbostel has 12 different house types to view ranging from traditional German to a contemporary flat roofed house. But what made this show village different to English show homes is that none of them were for sale on the site, the advertised prices and details are the cost for them to be built on your plot. No, the German system does not expect you to move into a new house that has already been speculatively built on a plot of land by a developer in the hope that it will suit your needs. The biggest difference comes about from the actions of local councils. In both the UK and Germany local authorities control the provision of new land for housing, but unlike the UK where parcels of land too big for an individual to be able to develop are granted permission for say 500 new houses and sold to a developer, in Germany the local authority buys the land, builds the road and infrastructure and waits for people and families wanting a new house to buy individual plots from them. The result, more individual houses, planning permission is virtually guaranteed as long as a few principles are followed and missing out the profits of developers reduces the costs. So if developers are not building the 500 houses on the edge of town who is building the houses? Well the answer is mainly the homeowner with differing degrees of professional and technical support. At one end of the spectrum you have people who approach an architect or designer to conceive their dream home and then employ a local contractor to build it. At the other end of the scale, you have people who want a less hands on approach, they employ a company who specialises in building new homes, who have a portfolio of houses to choose from and are only left with deciding on which house to choose and the style of bathrooms, kitchens and finishes etc. 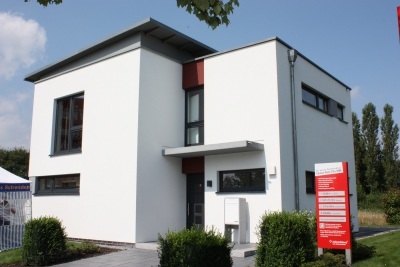 The Musterhauspark in Bad Fallingbostel is simply a portfolio of houses to visit, allowing potential buyers the opportunity to experience their future home albeit in a different location. Altogether at their parks the company has over 50 house types to view and that is from just one builder. Either by employing an architect directly, or by employing a house builder such as at Musterhauspark, the German homeowner ends up with greater choice and involvement in the process as well as better value for money. From visiting the houses it soon becomes apparent that our UK obsession with bedroom numbers does not cross the Channel, the houses at the park are mainly three bedrooms but the smallest of these is typically bigger than the so called master bedroom in the UK. The ground floors all have large open plan spaces and feel light and airy. 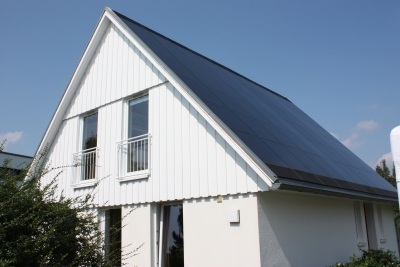 The houses are also technically very good, with high standards of fabric insulation supplemented by renewable energy sources, as a result, most houses have plant rooms that are used to house the boiler, tanks and heating controls for the various solar panels, photovoltaic cells or heat pumps. For an example of this brilliance, one house on the site which is shown below had a roof slope comprising entirely of solar panels with no tiles underneath, now UK housebuilders have to go someway to match that. For a three year period between the end of May 2013 and 30th May 2016 it may be possible to build single storey extensions to the rear of houses which would be double the size currently permitted without planning. The new law will allow in certain cases detached houses to be extended in depth by up to 8m and attached homes by 6m. In response to fears that the new proposals will be un-neighbourly as we demonstrated in a previous post, the Government has concocted a sort of half way house for planning to deal with these larger extensions. The new process will involve the need to notify the local authority of the proposed work, to which they will respond by serving notices on the neighbouring properties advising them of the works. The neighbours will have 21 days to object which is just the same as if planning consent was needed and the local planning authority must decide whether to accept the permitted development proposal or refuse it in a period of 42 days or 6 weeks. It is worth noting that the majority of these householder applications would usually be decided as a full planning application in 8 weeks. The policy introduces a right to appeal and a presumption in favour of development if the local authority fails to notify the applicant in the 42 day period. Assuming that the new process is only about determining whether an extension requires consent or not, any applications that are refused are being refused the right to build it without the need for planning permission. Anyone receiving refusal for permitted development would need to take stock and come to a decision whether to 1 appeal, 2 make a planning application for the proposal or, 3 scale back the project to satisfy the objectors. The rules apply for three years only and any extension must be completed by 30th May 2016. In our opinion, the new system is little more than a faster, half way house method of obtaining planning permission for larger extensions with the responsibility for restricting excessive extensions placed entirely in the neighbours hands. The process introduces uncertainty and an inconsistency into permitted development which has not existed before. For example, two identical properties in the same road can no longer be extended in the same way, as the deciding factor will now be whether the neighbour objects or not. As the presumption of the new regulations is in favour of development, a large responsibility is placed on the shoulders of the neighbour, who must decide whether to object to a proposal or accept an oversized extension that may impact on their outlook in order to keep the peace. This is a big step from the current system where neighbours have the protection of a planning system designed to consider their interest against excessive development, even if they do not speak out against a proposal themselves. The process which is designed to speed up building work could end up taking much longer. For example someone wanting to build a 3m deep extension on a semi detached house could start tomorrow without the need to notify the local planning authority. However if the neighbour wanted to build an extension out say 3.6m they would need to notify the planners and have to wait 42 days for the decision, if the decision of the council is to refuse the right to permitted development based on an objection, they would either have to await the outcome of an appeal or make a subsequent planning application. The need for the work to be completed by the 30th May 2016 adds another interesting dimension to this ill-conceived policy. Little provision appears to have been made for an extension that is half way through the build at the end of May 2016. Is a retrospective planning application then made? What would happen in the situation that the neighbour who may be different by that time, objects to the retrospective planning application or the local authority refuses it as being un-neighbourly? Will that extension have to be demolished? We are sure that the Government will issue another set of regulations to deal with the problems that will arise from these regulations. Our approach on all projects will be to consider the views of the neighbours from the outset. For the reasons set out in our earlier posting, we do not envisage many instances where we will be designing 8m and 6m deep extensions, but as always the battle will be fought in the areas that are not black and white but perhaps a little grey. Many people feel a sense of familiarity, warmth and welcomness from old buildings that they do not experience with modern architecture, these people would say that they; “feel at home in these places”, what these buildings offer however is a connection to our soul. Developers tap into this emotional nostalgia by building speculative modern houses that resemble or look a bit like houses from bygone eras. But, more often than not, these developer houses, or units as they are referred to by developers , with their Victorian or mock Tudor frontages and integral double garages are mere caricatures of the bygone homes they aim to replicate. Speculative housing is designed and built for unknown occupants and the race to the cash ensures that bedrooms are too small, individuality is lost and space is compromised. Unlike our European neighbours where around 50% of homes are built for the individual, only a few people in Britain get the opportunity to build their own home, the majority having to content themselves with the limited choice of pastiche speculative housing. But whilst developers build their look-a-like houses, architects and designers working on the 10% of individual commissions are all too often concerned with creating houses that are compositions of space, structure and form as an expression of the designer’s artistic ability which leaves little room for a connection to the homeowner’s soul. Bizarrely the most expressive of these artistic creations are honoured with prestigious architectural awards by other architects. We therefore have a situation where developers build houses or units for their shareholders, not their desire to meet our emotional needs and architects are taught and praised by their peers for designing houses not homes. So what is a Home? The dictionary definition for house and home are subtly different; A house is a building for human habitation, whereas a home is a place where a person, family or household lives. As opposed to a house which is about the architecture or the fabric that meets our physical needs, the essence of a home is something more which specifically relates to the individual or family psyche and emotional needs of the people that live in it. Homes are not simply a piece of architecture with a series of objects within the structure, but are a carefully considered group of sourced possessions. These objects and furniture often collected and curated over a lifetime, carry the memories and personality of an individual’s desires, wants and needs, all within a building that makes them feel at home. A home is therefore a special house that has been tailored by the individual to their needs. The planning system, like speculative housing is a numbers game. Policies talk about units, houses and infrastructure, not homes and families. The system generally encourages large concentrations of houses, whilst doing little to encourage one off homes, individuality or something that goes against the current pattern. Planners adopt the language of architects and focus on the form and exterior envelope of the building, putting the perceived needs of people in the locality, who have not expressed an opinion, ahead of the needs of the prospective home owner. Decisions are regularly taken by Planners or their Committees to decide the outcome of planning applications without actually meeting or having a dialogue with the family group that wishes to live in the proposed home. Despite the vast majority who live in speculative housing, it transpires that half the UK population would at some point in their lives like to build their own home. Now I don’t believe that it is the burning desire to be carrying a Hod full of bricks which makes these Brits wish to build their own home, but perhaps a wish to have a greater involvement in the design and ownership, a different sort of ownership that can only come from being responsible for every step of the way. To ensure these speculative self builders achieved a great “place that they feel at home in” they would need to articulate their brief clearly to the designer, thus ensuring that the home represented their individuality and not that of their designer. Around a year ago the Government launched an initiative to increase the number of available homes to help self builders. This policy is not so much driven by the wish to improve our housing stock by allowing individuals to build their own homes, but as a way to kick start the housing industry which has seen a collapse in speculative housing since the recession. Whatever the motives, a policy which encourages councils to develop planning policies to take account of self builders, asks lenders to offer better finance , while at the same times reducing and simplifying regulations, has to be applauded. Locating and buying land, obtaining permission and building a house all take time and the uptake is what will be the judge of this policy. However, unless the Government is going to free up large swathes of the countryside or requires developers to break up their land banks the availability of plots will always be the stumbling block. If larger numbers of people start self building, we could see a resurgence of interest in individual homes and a greater diversification of our housing stock in the way that Germany and other EU countries have. In the meantime in a bid to resolve the shortcomings found in today’s homes, I will busy myself with designing home extensions and remodelling projects tailored to suit the needs of my clients and their families. At the end of the summer the Government announced in a blaze of publicity that for one year only the rules on Permitted Development (work that can legally be undertaken without planning permission) would be relaxed. The story indicated that the relaxation would double the size of extensions that could be built without permission. The change it was said, would free householders of the red tape that usually accompanies a home extension, thus allowing more building work which would aid the economy. The story made the main 10.00pm news and for a couple of days was chewed over in the national papers until they lost interest. The headline figures quoted were that householders would be able to extend a detached house to the rear by up to 8m in depth without obtaining Planning Permission and a semi detached or terraced property by up to 6m. For a week or so after the story broke I found myself having to explain to clients the potential impact on their proposal. Not that I purposely set out to design schemes that will not need consent, but removing a layer of red tape in not having to gain planning permission has to be a good thing or not? I don’t take any planning application for granted, but on the smaller projects the demands of many planning offices are disproportionate to the scale of the proposal. And as every application boils down to a subjective view as to whether the planning officer or the local councillors support the scheme, it is an obstacle I would rather not negotiate unless needed. So on smaller projects it is appreciated when the project can proceed as permitted development without the uncertainty and extra hurdles that a planning application entails. So given my position you would think I would relish the opportunity to design larger extensions without the interference of the local planning authority. However, despite the benefits of greater freedom from planning I strongly oppose the changes. The current rules on Permitted Development which can be found on the planning portal extend back to 2008 when a project and impact based approach was introduced to determine whether something required permission. 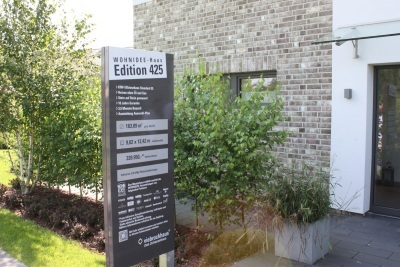 The project impact based approach, allowed a greater degree of freedom for householders to extend their properties controlled by various dimensional constraints that protect the surrounding neighbourhood. 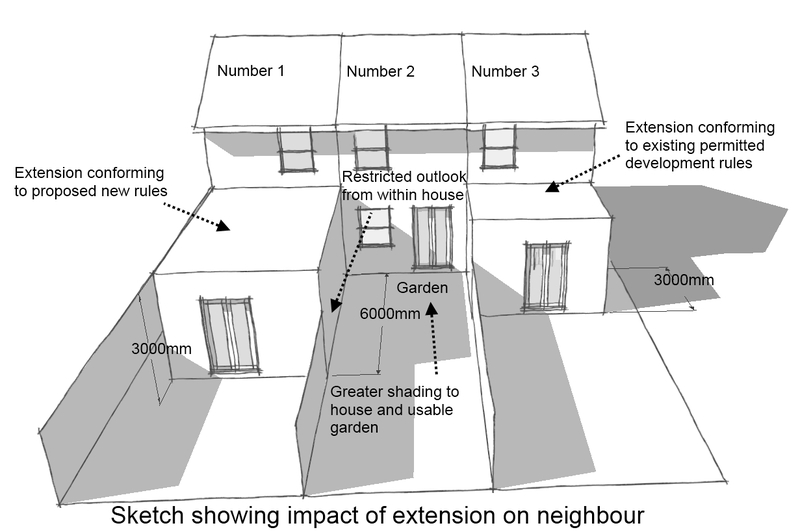 The dimensional constraints are the only protection that neighbours’ have from unneighbourly poorly designed or located extensions. For example an attached house can currently be extended by 3m to the rear with a single storey extension. Whilst the 3m depth is most likely an arbitrary figure with little logic or science behind it, it does never the less allow an attached house to be extended by a reasonable but small room depth, or more often when opened up to an existing room at the rear of the house, can create large room depths which are typically 6 to 7m deep. In addition 3 m is around the depth that a lean to tiled roof can comfortably be pitched to allow a waterproof roof to be installed beneath most upper windows. The 3m depth invariably has an impact on the outlook of adjoining neighbouring windows, creating partially restricted views when looking out of windows which are sited close to the boundary and a degree of shading which varies with the orientation of the property. But at 3m a neighbouring extension is unlikely to appear as a dominant or be highly detrimental to the neighbours’ outlook. If the existing rules on Permitted Development have little logic or science behind them, the proposed changes have absolutely none. The changes can only be viewed as a knee jerk reaction to a politicians’ question of “how can we double the number of extensions built without planning?” to which the response by some civil servant was presumably “Double the permitted depth.” This statement assumes that there is the same number of people wishing to add 6m to their homes as there is wanting to add 3m. My experience as a designer having talked and listened to over 1000 people wishing to extend their home does not support that view. In my opinion the distance needed to double the number of projects not needing planning would be around 3.6 to 4.5m. The very notion that doubling the permitted depth would double the number of extensions that could be built without planning, shows a complete lack of understanding of how the majority of people think about extending their homes. Typically people want to add a room or add extra space to an existing room, adding 3 to 4m gives them that space. Adding 6m to an existing room would create a room depth of say 9 to 10m which on an attached house which are usually narrower than detached houses would be a crazy size, that arrangement or one that involved the space being divided up into smaller rooms would also create problems of natural lighting in the old part of the house. The suggested 6m depth also overlooks the fact that the majority of householders care about the look of their house and do not necessary extend to the maximum permitted, but will limit the size if it can result in a pitched roof that better matches their home. These same people will often have an interest in not upsetting their neighbours and would again limit the size of the extension near the boundary so as not to cause offence. It is therefore people who do not consider the need for their own property to have a particularly good layout with natural lighting that will benefit from the proposed changes. These same people are unlikely to care whether their extension echoes the style of their house and will ignore any consideration of the neighbours in their bid to build the maximum permitted extension. Under the new proposal, a householder wishing to add a flat roofed extension could build a 3m high wall, 6m long on the boundary with an adjoining neighbour. Such an extension would severely restrict the outlook from the rear of the neighbouring property and subject to the orientation cast large areas of shadowing on the rear windows whilst rendering parts of the rear garden in shade. If this were to happen on both sides of a terraced house, the outlook would be tunnelled and the shade would make parts of the garden effectively unusable. The middle neighbour would suffer at the cost of allowing the neighbouring properties to extend. In the existing course of events these extensions would require planning permission and would rightly be refused by any sensible planning authority. If the existing rules on Permitted Development are based on a project and impact based approach, the proposed changes will throw away any regard for the consideration of the neighbours and could no longer be said to be based on impact. PS. Following the introduction of the new rules on Permitted Development read how the changes will be implemented to safeguard the views of neighbours in Permitted Development – the Changes 2013.